This offseason, our analytics department has produced ground-breaking work on the importance of quarterback pressure from the edge and it’s devastating effect on an opponent’s passing game. Within that body of work came two clear conclusions. One being the simple fact that a strong pass-rush directly impacts the most valuable play in football, the downfield pass. The other, the fact that pressure from the edge is inherently more valuable to a team than pressure from the interior. When you enter the discussion about who is the best at bringing pressure from that edge, two names will spring to the top of the conversation: Von Miller and Khalil Mack. The jury is still out on which of the two AFC West stars can claim the title, but their names will appear first more often than not. When you expand the discussion to league’s top five edge rushers, you’ll hear names like Cameron Jordan, Joey Bosa and Brandon Graham. However, there is one name you that probably won’t hear, but should. And that’s Ryan Kerrigan of the Washington Redskins. Kerrigan was drafted with the 16th overall pick of the 2011 NFL Draft, a draft that was stacked with the elite pass-rushing talent of Von Miller, Aldon Smith, J.J. Watt, Robert Quinn and Cameron Heyward, just to name a few. 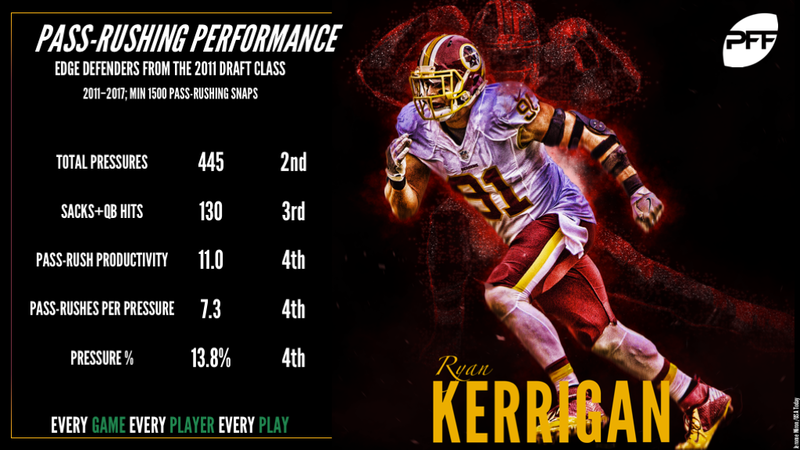 Since being taken with that pick, Kerrigan has not just held his own against that formidable group, he’s consistently outperformed most of them and developed into one of the most under-appreciated pass-rushers of the class. Pass-rushing aside for a minute, one of the main reasons Kerrigan has been such a great pick for the Redskins is his sheer toughness and dependability. Over the last seven seasons, Kerrigan has racked up a colossal 2,727 run-defense snaps and 3467 pass-rushing snaps, which is the most and the second-most among his classmates in that span, respectively. When you add in the 616 times that he dropped into coverage on a passing play, the total comes to a combined 6,810 defensive snaps over his last seven seasons, which is 379 more than the next closest edge defender from his class. 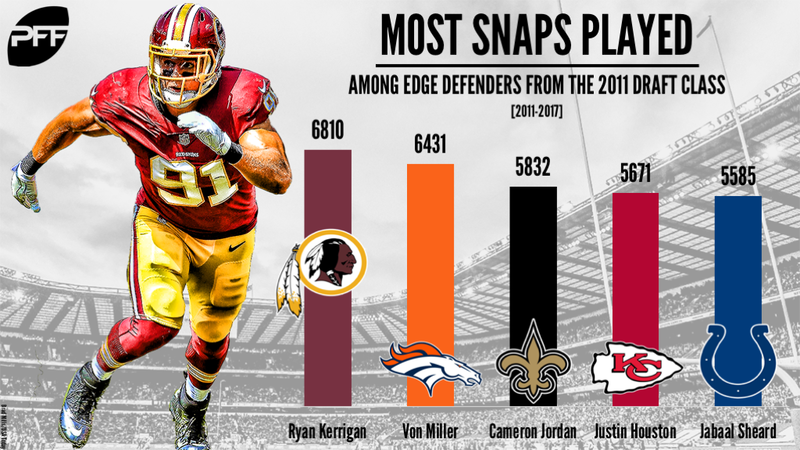 Even more impressive, however, is the fact that Kerrigan has been on the field for 88.6 percent of his team’s defensive snaps during his tenure in Washington, which is a true testament to just how important he is to the Redskins defense in all facets of the game. That figure of 88.6 percent beats out every single edge defender in his class, notably bettering Miller (83.6 percent), Jordan (86.7 percent) and Justin Houston (85.4 percent). Nowhere is Kerrigan’s production more apparent than in his pass-rushing grades, where he has accumulated grades of 80.0 or more in five of his seven professional seasons. While that may not sound as impressive as it actually is, Kerrigan’s consistently good production makes him one of just 10 edge defenders to register pass-rushing grades north of 80.0 in at least five of the last seven seasons, and Miller and Houston are the only other players from the 2011 draft class to achieve this. The same excellent production can be found in his game-level grades. Since 2011, Kerrigan has achieved a pass-rushing game grade of at least 80.0 in 31 of his 112 professional contests, which is tied for the seventh-most among all edge rushers in that span and just falls behind just Houston (33 in 90 games) and Miller (62 in 104 games) among edge rushers from the class of 2011. Kerrigan’s extraordinary consistency is not only evidenced by his grades. At Pro Football Focus, we have a wealth of one-of-a-kind, advanced metrics that we can use to further evaluate player performance, and our pass-rushing productivity is one such metric. PFF’s pass-rushing productivity measures the pressure created on a per-snap basis, and considers the total number of sacks, hits and hurries accumulated per a player’s pass-rushing snaps. The resulting metric gives us much more information than just how many times an edge-rusher put a quarterback on the ground, and is much more indicative to future sack totals, than current sack totals are. 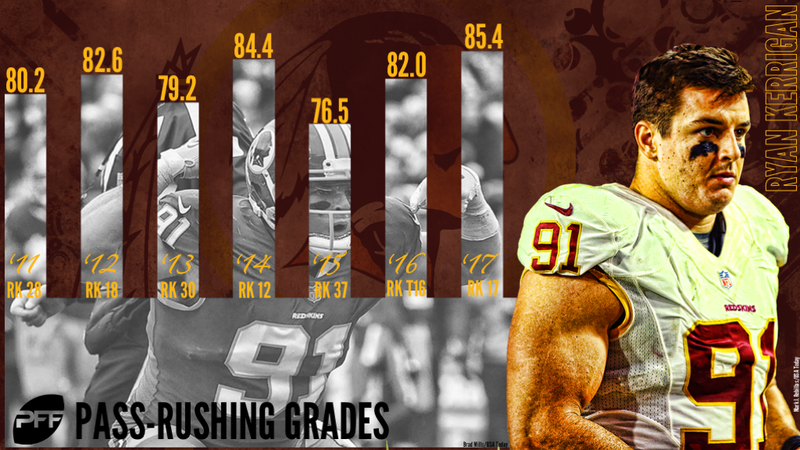 Since his arrival in the NFL, Kerrigan has finished in the top 15 in pass-rush productivity in five of his seven professional seasons, notably finishing in the top five during three of those campaigns. His personal best came last season, where his pass-rushing productivity of 13.0 tied for third among qualifying outside linebackers, trailing just Elvis Dumervil (14.8) and Miller (14.5). His entire body of work makes him one of just seven edge defenders to register a pass-rushing productivity of at least 9.5 in at least six of the last seven seasons, once again joining only Houston (six) and Miller (seven) as the only edge rushers from the class of 2011 to achieve this. To cement the point further, his durability and his season-to-season performance are not the only elements that establish Kerrigan as one of the hidden gems of his draft class. In fact, one only has to look at his career numbers alone to see just how good he has been compared to his classmates. Over his last seven seasons, Ryan Kerrigan has accumulated a monstrous 445 regular season pressures, which is second to only Miller (494) in that span, while his 130 combined sacks and quarterback hits puts him third behind only Miller (179) and Jordan (131). To drive the point home, you only need to see just how well Kerrigan has performed compared to Miller, who was the top pass-rusher of the class back in 2011 and is arguably the gold standard for pass-rushers at the present moment. In every year of their respective careers, Kerrigan has been within 25 pressures of Miller, and notably outperformed him during the 2014 season, where Kerrigan’s 72 pressures from 441 pass-rushing snaps bettered Miller’s 71 from 484. 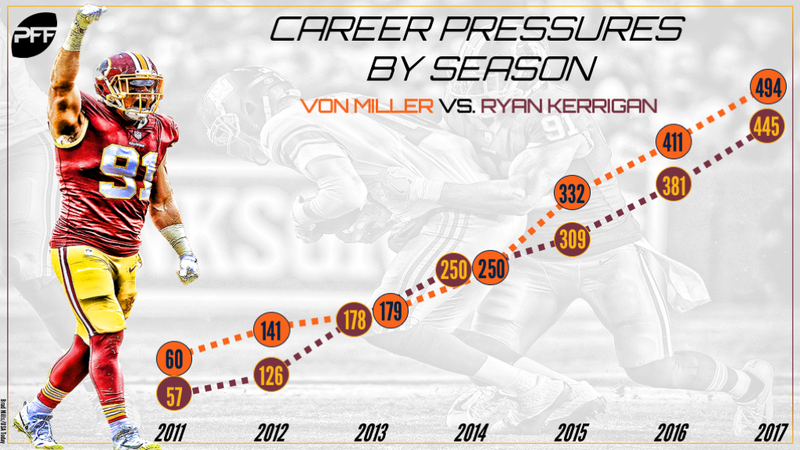 After the first four years of their respective careers, the two were tied for career regular season pressures and Kerrigan has kept within a very respectable distance of Miller ever since. By now, his status as one of the best pass-rushers of his draft class should be beyond doubt, but what if we were to look beyond that? If we look at his most recent performance, we can actually make the argument that Kerrigan is not just the hidden gem of his draft class, but arguably the most underrated pass-rusher in the entire NFL. To make this argument, we have analyzed data from the 2014 season to present, so we can measure his performance against the likes of Mack, Bosa, Chandler Jones, along with the rest of the league’s best at the position. Over those last four seasons, Kerrigan has produced 267 quarterback pressures, which is the sixth-most among all edge defenders in that span, but his 53 sacks lead the same group and are three more than Miller, the next-closest player on the list. On his 1,802 pass-rushing snaps over the last four campaigns, his cumulative pass-rushing productivity of 11.8 ranks 10th at the position among edge defenders with at least 750 pass-rushing snaps and is just three spots behind pass-rushing ace Mack (12.0). 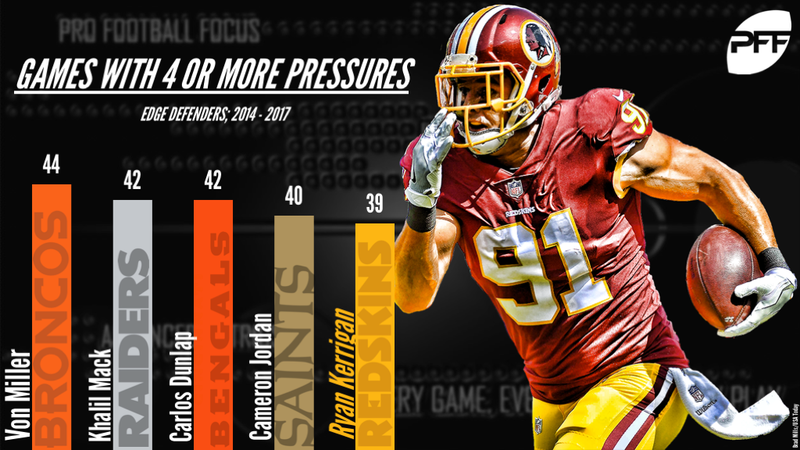 However, nothing proves his value as a pass-rusher more than his ability to create pressures without help, and this is something that Ryan Kerrigan has excelled at over recent years. Since 2014, Kerrigan has tallied 152 solo pressures (the fourth-most among edge defenders) and he’s averaged just 2.32 seconds to create those solo pressures, which is tied for the sixth-quickest mark among edge defenders with at least 50 solo pressures since 2014. 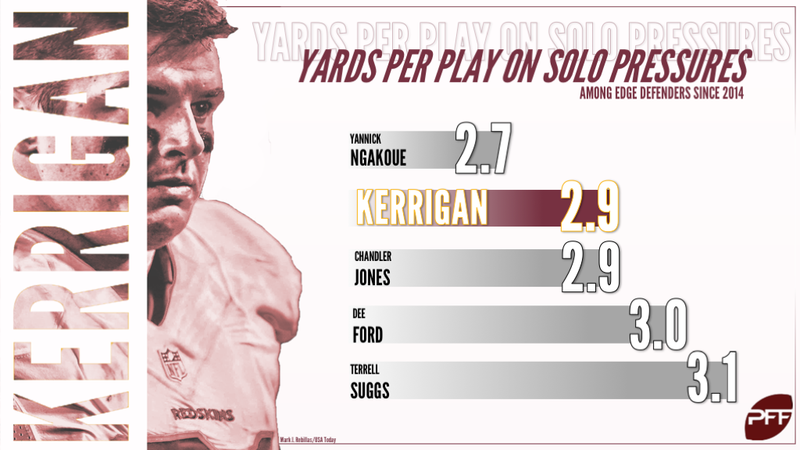 More impressively however, is the fact that on those solo pressures, Kerrigan limits the opposing offense to just 2.9 yards per play – which is tied for the second-best mark among the same group. Now, in today’s NFL, there is no greater asset to a defense than a consistent pass-rusher who can consistently wreck the opposing passing game, no matter who or when they play. An edge rusher that can do that has the ability to singlehandedly put the team on his back and win the game for his team. You can look no further than Miller’s MVP performance in Super Bowl 50 as proof of this. Since 2014, the Super Bowl 50 MVP leads all edge rushers with 44 games with at least four quarterback pressures, followed by Mack and Carlos Dunlap with 42. Jordan then takes fourth with 40 games with at least four quarterback pressures, followed closely by none other than Washington’s reliable outside linebacker Kerrigan, with 39. When you look at his entire body of work, whether it’s his durability, his consistency, his sheer production, his ability to single-handedly create quick pressure or even his big-game potential – it’s easy to see why Kerrigan should be considered one of the best pass-rushers in the NFL. And even if you don’t believe that, you’d do well to remember the No. 91 when you’re watching the Washington Redskins this year.